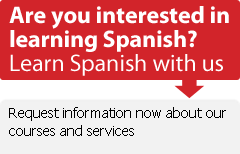 As I sat here readying myself to post some tips about learning Spanish, ways I try to sound more naturally Spanish after more than 2 years in Spain, it occurred to me that you might not be learning Spanish surrounded by native speakers. Well, I have a tip for that, too! I lived in Chicago before I moved to Spain, and fed my burgeoning Española by getting together once a week with a group of Chicagoans learning Spanish. We'd gather ever Tuesday at a local Spanish restaurant, order up some tapas and vino, and officially ban English. The waiter, inevitably a Spanish speaker, if more likely to be Mexican than Spanish, was always happy to oblige, and always more than patient with our linguistic struggles. More than once ordering in less than perfect Spanish brought far more food than we wanted or plates piled high with snails, eels and other mysterious tapa wonders we never meant to order to our table, but it was all part of the night's lesson. Meetup is an organised way to do just what I did with that random group of Spanish-learning Chicagoans. As of this morning Meetup's Spanish map shows 32, 317 native speakers and students of Spanish who have joined Meetup's 137 Spanish groups in 125 cities and 13 countries to get together once a month and speak Spanish in a warm, informal atmosphere. The site includes a search box to find a group near you, and a posting board if you don't see a group in your town but would like to start one. C'mon, Spanish gets easier once you start speaking it freely, loudly and casually, in a boisterous group of friends. I promise.